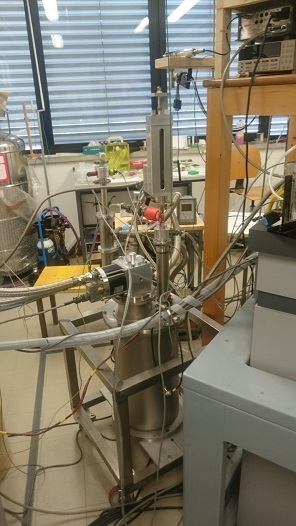 AC magnetic susceptibility (ACMS) measurement is a useful method to probe time-dependent magnetization dynamics in materials. In ACMS magnetometry, a primary coil applies a small AC magnetic field to a stationary sample, and the induced AC moment is detected with a secondary coil. 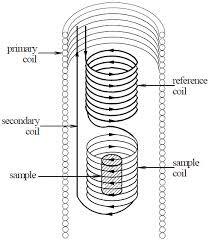 The secondary coil is made up of two parts; one sample coil to detect the sample moment, and another counter-wound reference coil to null the self-inductance of the sample coil. A lock-in method is used to detect the sample AC signal at the driving frequency. In ACMS, one measures two quantities; the real (in-phase) AC moment, X’ and the imaginary (out-of-phase) AC moment X”. The phase is relative to the driving AC field in the primary coil. The maximum AC frequency is typically in the kHz range, and the AC amplitude is typically a few Gauss. In the low frequency limit, the real (in-phase) AC moment X’ represents the slope of the DC M(H) curve. ACMS is sensitive to small changes in M(H), not to the absolute value of M(H), therefore it is very sensitive to small magnetic shifts even when the absolute moment is large. At higher frequencies, the AC moment of the sample does not follow the DC magnetization curve due to dynamic effects in the sample. The phase of the AC moment may lag behind the driving AC field. The imaginary (out-of-phase) AC moment X” is indicative of dissipative processes in the sample; these may be AC frequency and amplitude dependent. What magnetic phenomena can ACMS characterize? Typically, the susceptibility X diverges at the critical temperatures of magnetic phase transitions. ACMS allows the precise determination of critical temperatures. Furthermore, the X’ and X” versus temperature curves can be used to extract the critical exponents at the transition; this allows one to distinguish between various models of magnetic interactions (for example, SD Heisenberge, X-Y, or Ising models). A spin-glass is where the magnetic spins collectively have random interactions with each other, resulting in irreversible and metastable states. The spin-glass freezing transition temperature is determined from the cusp of X’ vs temperature; this is also frequency-dependent, and is a characteristic signature of a spin-glass system. 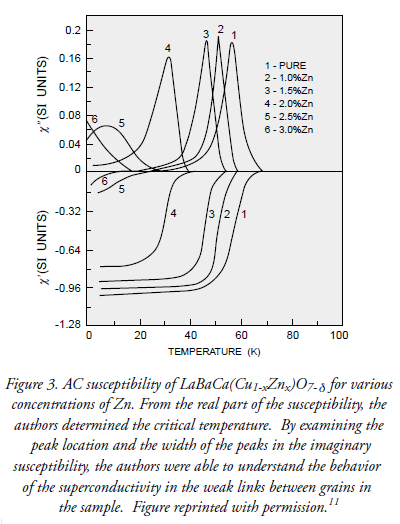 The non-zero X” signal characterizes the irreversibility of the spin-glass state below the spin-glass freezing point. Mulder, C. A. M., A. J. Van Duyneveldt, and J. A. Mydosh. “Susceptibility of the Cu Mn spin-glass: Frequency and field dependences.” Physical Review B 23.3 (1981): 1384. A ferromagnetic particle of sufficiently small size would exhibit single domain state below a blocking temperature. Above this blocking temperature, the moments are free to rotate with the collective behaviour of such particles are superparamagnetic, where the constituent moments are single ferromagnetic particles (rather than atomic moments in a normal paramagnet). A wealth of information can be extracted from X’ and X” to characterize a superparamagnetic system. The blocking temperature of such a system depends on the measurement time scale. This is where ACMS is very useful, as by merely changing the AC frequency, different measurement time scales can be probed. Furthermore, the particle size distribution and degree of interaction between the particles can be extracted from a X’ and X” versus temperature curve. Luis, F., et al. 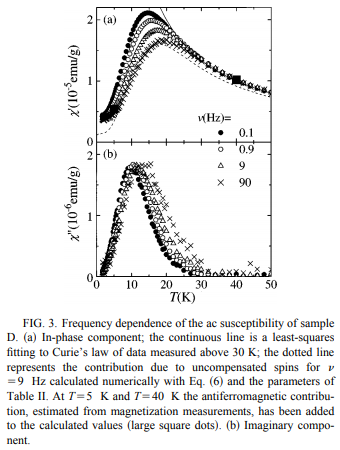 “Resonant spin tunneling in small antiferromagnetic particles.” Physical Review B 59.18 (1999): 11837. ACMS is a useful tool to characterize a superconductor. A superconductor undergoes a drastic change in magnetic susceptibility at its critical temperature, where the material has small susceptibility above its critical temperature, but becomes a perfect diamagnet below its critical temperature with very large susceptibility (X’ = -1). This allows the precise determination of critical temperature. Furthermore, one can also extract critical current density from the imaginary component of the susceptibility X”. Singh, R., et al. “V. P: S. Awana, J. Albino Aguiar, and Md. Shahabuddin.” Phys. Rev. B 55 (1997): 1216.